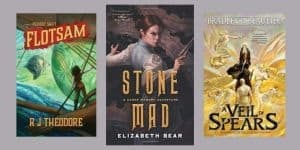 20 Best New Sci-Fi/Fantasy Books: March 2018 | Nerd Much? If your TBR pile is looming, you might not want to read this list of amazing books slated to release this March. 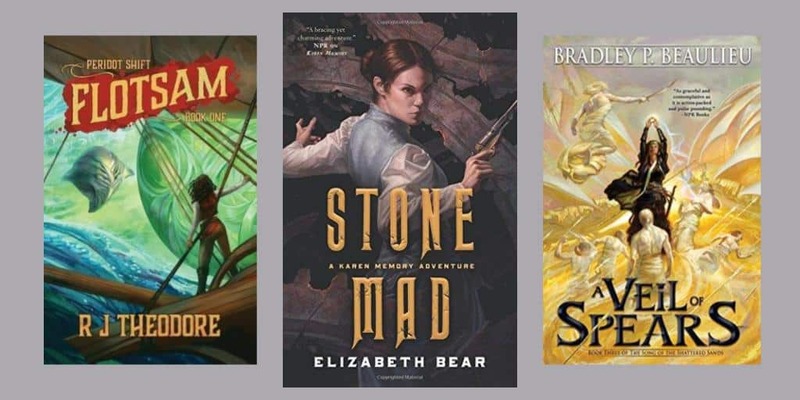 It’s quite the month for sf/f books. There’s a healthy mix of new series, standalones, and highly anticipated sequels coming out. Most of all, this is a month genre-bending. 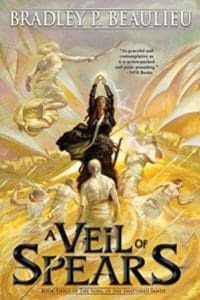 There’s nothing wrong with classic sword-and-sorcery, but it’s nice to see more historical fantasy and retelling of classic myths and stories. 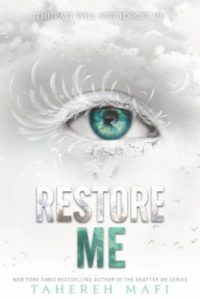 A few highlights are debut author Tomi Adeyemi’s Children of Blood and Bone and Tahere Mafi’s Restore Me, the latest in her bestselling Shatter Me series. The Hunger by Alma Katsu is sure to be a gripping historical horror novel. There’s a lot to choose from. Here are the 20 best new sci-fi and fantasy books releasing in March 2018. Charlotte Rowe was raised by the two serial killers who murdered her mother. When she is finally free of them and of her controlling father, she learns that an experimental drug has granted her dangerous powers. And she knows exactly what she’ll use them for. 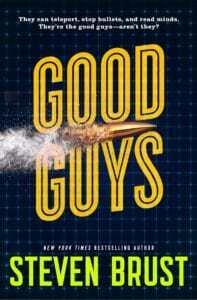 We’ll see if this thriller can be more than just a sci-fi The Girl With the Dragon Tattoo, but there’s nothing like a book with a badass protagonist to root for. 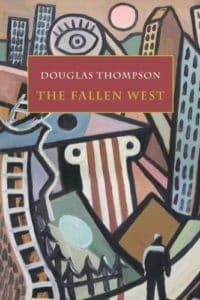 There won’t be anything else quite like Douglas Thompson’s The Fallen West this year. This collection of poetry and short stories follows characters wandering into other worlds and explores the bleaker sides of the human condition. 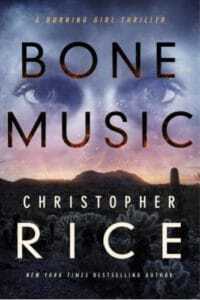 The outstanding cover art was done by the author’s late brother, Ally Thompson. Douglas Thompson’s unusual collection is bound to be experimental and thought-provoking. This standalone fantasy follows Marin, a young woman who is a pirate, like her ancestors before her. The new leader of her home island promises its inhabitants that there is a chance to escape, but Marin knows firsthand that there’s nowhere to escape to. Meanwhile, Ross, the son of the president of an oil empire, is arrested during a race riot and must trust a pirate to find his way home. But she has other plans for him. 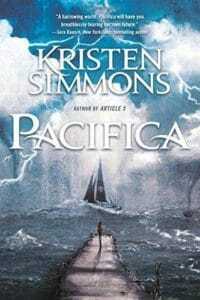 Pacifica is set in a climate-changed future; the plot is already compelling—hopefully the worldbuilding holds up as well. A Carthusian monk named Niccolucio watches all of his brothers perish in the Black Plague. This tragedy is observed by Habidah, anthropologist from a different universe, who decides to interfere and save Niccolucio from his fate. Together, they become wrapped up in a plot to overthrow a universe-spanning empire. This is definitely a book that doesn’t fit into any of the usual genres, and that’s not a bad thing at all. The fourth book in Tahereh Mafi’s bestselling Shatter Me series continues the story of Juliette and Warner. Juliette, who can kill anyone by simply touching them, is the Supreme Commander of North America. But the fight isn’t over—new changes within her will force her to choose to use her power and influence for good or risk losing control. 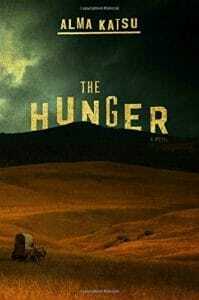 In The Hunger, the infamous Donner Party (a group of American pioneers who resorted to cannibalism to survive), experiences a series of horrors and crimes—and the surviving members of the party suspect that something supernatural may be the cause of their misery. Angus McIntyre makes his debut with The Warrior Within, which follows Karsman, the leader of a small town on a planet controlled by a religious autocracy. What makes him different is that one dozen people reside in his head, each with their own personalities and skills. A group of commandos come to the town looking for a woman who they intend to kill. 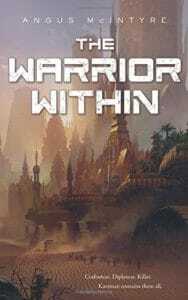 They begin to wreak havoc, and Karsman must decide whether to tap into the personas in his mind to protect this woman. While the premise isn’t wholly original, this story combines several interesting elements and sounds like a fun sci-fi adventure. 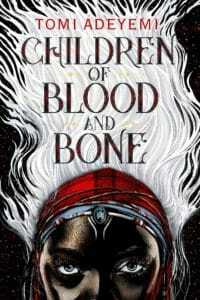 Children of Blood and Bone, the debut novel from 23-year-old Tomi Adeyemi, is going to be a big one. In Orïsha, magic was once everywhere. Zélie Adebola remembers a day when magic was a part of everyday life, but those days are past. Now, she has one chance to bring magic back. With the aid of a princess turned against her own monarchy, Zélie will overcome a world of danger and spirits while learning to master her own powers. 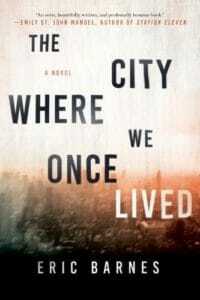 This highly anticipated debut is also being adapted for film. Here’s to hoping it’s the next big thing! Stephen Brust (known for the Vlad Taltos series) has a new standalone coming next spring, and it sounds like a blast. Donovan is shot multiple times by a cop for being black — but it doesn’t kill him, because he is unusual. After this experience, he is revived by The Foundation, an organization that trains individuals with unique abilities. The Foundation is highly secretive, yet they pay their employees minimum wage. There’s something off about this society for people with powers. Don’t miss out on the first standalone from Brust in two decades. 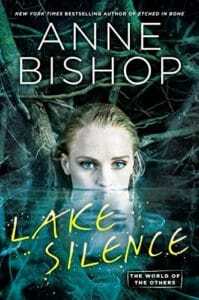 Set in the same world as The Others, Anne Bishop introduces divorcee Vicki DeVine, who owns a resort in Lake Silence. Though the town is filled with humans, it is not controlled by them — the Others (vampires and other paranormal beings) are in charge. When a dead body is found by a tenant, Vicki finds herself the primary suspect, even though the conditions of the murder suggest that no human could have been responsible. Things get dangerous quickly as Vicki and her friends seek answers in dangerous places. Fans of Bishop’s The Others series are sure to enjoy this standalone novel, and new fans will find it to be a great introduction to Bishop’s fantastic world. 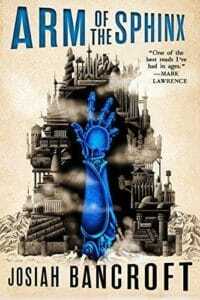 Remember how Josiah Bancroft’s Senlin Ascends was published by Orbit earlier this year? Its sequel is nearly here. Bancroft’s Books of Babel series follows a stubborn, idealistic school teacher named Thomas Senlin in his search for his wife in the massive Tower of Babel. The books are part steampunk, part fantasy, and absolutely filled with incredible wonders. 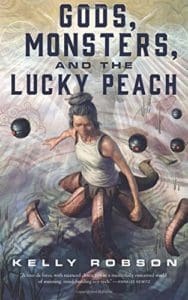 Set in the year 2267, Gods, Monsters, and the Lucky Peach introduces Minh, who belongs to the generation of people who moved from their underground homes to the Earth’s surface to make it livable again. Also, time travel has just been invented, and Minh joins an expedition to the cradle of civilization four thousand years earlier. I don’t have answers to what’s going on with the cover, but it definitely looks interesting. 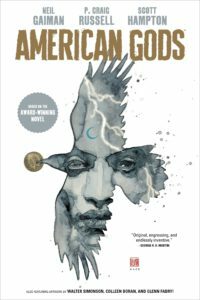 That’s right—Neil Gaiman’s American Gods is being adapted as a graphic novel. The Starz adaptation has already done the book justice, but a graphic novel adaptation of the classic American(ish) fantasy is just as exciting. There will be three volumes in total in beautiful hardcover editions. What would happen if every thought, emotion, and idea were instantaneously shared through a massive international network? What would a global society built upon this look like? And what would happen if this network vanished? 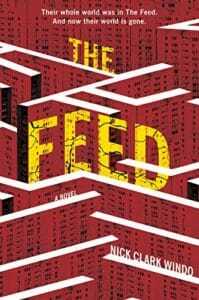 That is exactly what happens in Nick Clark Windo’s close-to-home sci-fi, The Feed. Kate and Tom had kept their use of the Feed to a minimum while it existed — but when their six-year-old daughter vanishes in a world suddenly disconnected, they must use whatever means and resources they can to find her. The world is filled with disease and danger overnight, and people change when their lives are changed in such a fundamental way. Don’t miss out on this terrifying, near-future sci-fi tale of family, humanity, and massive change. Elizabeth Bear gives Seattle, Washington a steampunk makeover in her Karen Memory series. The second book begins with Karen and Priya on their newly-purchased ranch near Rapid City. Their lives are soon disrupted by a pair of spiritualists and a tommy-knocker—a mischevious creature that lives underground and pranks miners. Bear created a wonderful, recalcitrant character in Karen Memory. Karen alone will probably make this book worth it. The third book (of a planned six) in The Song of Shattered Sands continues Bradley P. Beaulieu’s Arabian Nights-inspired epic fantasy. Çeda is a young woman from the slums who defied the order of the kings of Sharakai and has committed crimes against the city. Now, hunted by the kings, she plans to return to Sharakai and free the immortal slaves who serve the kings. 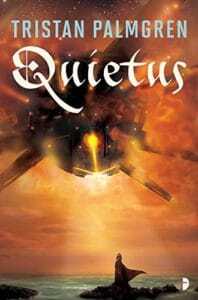 The Song of Shattered Sands has been very well-received, and Beaulieu is churning one out every couple of years. This is a great time to jump into the series. 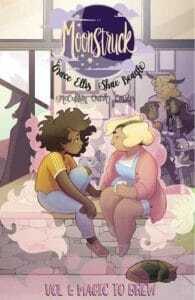 The latest from Grace Ellis (Lumberjanes) is about Julie, a barista/werewolf who takes her new human girlfriend to a magic show. Fantasy creatures are fairly common in the world of Moonstruck. After their friend Chet (a centaur) has a spell put on him by the nefarious magician, Julie and her girlfriend set after the magician to put things right. It sounds wacky and wonderful, and Shae Beagle’s illustrations are sure to go well with Ellis’s whimsical style. 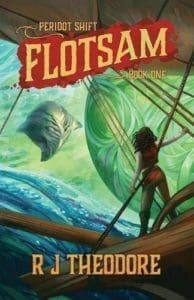 The steampunk-, magic-, and cultist-filled world of Flotsam introduces Captain Talis, who is trying to keep her crew fed and her airship repaired when a job lands her with a mysterious ring. Talis must find a buyer for the ring as she begins making dangerous enemies. Climate change has left its mark on civilization in the near future, and one city is divided into North End and South End. North End is collapsing and mostly abandoned, save a small colony of scavengers and survivors. Among them is the unnamed narrator, who has a past he’s trying to forget. When outsiders begin moving into North End, the narrator finds himself feeling protective of the dismal place he calls home. 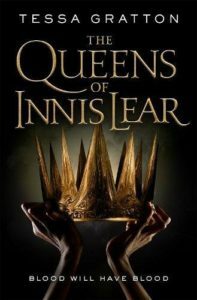 Inspired by Shakespeare’s King Lear, Tessa Gratton has created an epic fantasy world founded on powerful magic and tense politics. Three powerful sisters hold the fate of the kingdom in their hands. 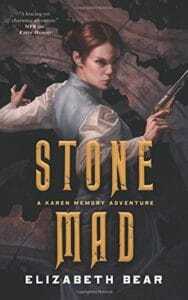 Gaela seeks revenge—and to put herself on the throne. Reagan is ready to scheme her way to the crown by producing an heir. Elia wants only to protect the king—her father. Shakespeare-inspired epic fantasy is something I didn’t know I needed on my shelf. Are there any that I missed? Let me know in the comments.